With over 260 affiliated practices in 39 states, AD&I is continuously opening new locations. In this “Make Your Move”, we want you to experience what it could be like as the Sioux Falls, South Dakota affiliated practice owner. From an on-site lab, to a $50,000 sign-on bonus, and full business service support, we want you to be set-up for life-changing success. Read more to learn about what will make this special city your home. What place offers a thriving economy, midwest charm, exciting cultural opportunities and a waterfall in the center of it all? No other than Sioux Falls, of course. The city, South Dakota’s largest, is located on the border, where the state buddies up to Minnesota, Nebraska and Iowa. Ranked in Livability’s 100 Best Places to Live in 2018, Sioux Falls has it all. The Big Sioux River cascades into that famous waterfall, which lies within Falls Park, one of the area’s 80 parks to choose from. And with 28 miles of paved trails that make up the Sioux Falls River Greenway, this midwest city is beauty at its best. Waterfall that runs through Sioux Falls, South Dakota. Sioux Falls, the 15th Happiest City in the Country, comes alive as people from all over stroll the countless breweries, bakeries, coffee shops and, not to mention, 700 restaurant options. You’ll meander down the cobblestone walkways of Phillips Avenue, a popular shopping destination for antiques, menswear, boutiques and more. Art can be found around every corner as the city is lined with sculptures year-round, part of the city’s annual Sculpture Walk, with one artist granted the People’s Choice award by the public. If music calls you, in October Sioux Falls hosts the Festival of Bands, a regional competition that welcomes over 40 Midwest marching bands to participate in a parade that runs through downtown. Year-round entertainment can be found at the Washington Pavilion, an art museum, hands-on science museum, event space, and performing arts venue all rolled into one. Enjoy some of the most beautiful downtown scenery you could imagine — all by the water! Sioux Falls is growing and thriving. With an unemployment rate under 3% it’s well below the national average. Jobs are plentiful, stemming from the large number of financial institutions and top healthcare systems that call Sioux Falls home. These industries, like others that are gravitating toward Sioux Falls, enjoy many benefits including the lack of a state corporate income tax. Enjoy nature, mountains, wonderful schools, and most importantly think of all the beautiful memories you and your family could create. This city offers a low cost of living, great schools, a plethora of nature, sports and entertainment options and is easy to get around. It’s got that small-city vibe, yet filled with everything a big city offers. And so, for those reasons and many more, be prepared to fall in love with Sioux Falls. Join this engaged friendly forward-thinking community by becoming the practice owner of the AD&I affiliated Sioux Falls location. Here you are free to do what you do best while maintaining clinical autonomy. You’ll give people their smiles back every day and enjoy the gratification that comes with an on-site lab. To top it all off, you’ll make a great living while still having time to enjoy life in Sioux Falls! 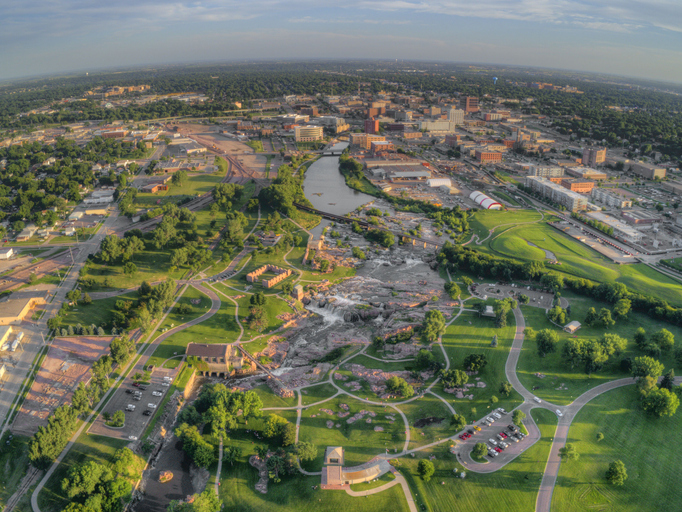 Summer Aerial View of Sioux Falls, The largest City in the State of South Dakota. DID YOU KNOW: The Sioux Falls were created 14,000 years ago during the last Ice Age. Are you ready to create smiles? Learn more about 100% ownership as an affiliated practice owner of a Affordable Dentures & Implants practice. It’s time to begin the journey of bringing the value of a smile back into people’s lives.